This CellML version of the model has been checked in COR and PCEnv and the model runs to replicate the results in the original published paper. ValidateCellML verifies this model as valid CellML with full unit consistency. The mitotic cell cycle can be defined as the sequence of events by which a somatic cell replicates all its components, and then divides them equally between two daughter cells. The end product is two genetically identical daughter cells. Cell division is an essential component of the biological processes of growth, reproduction and development. 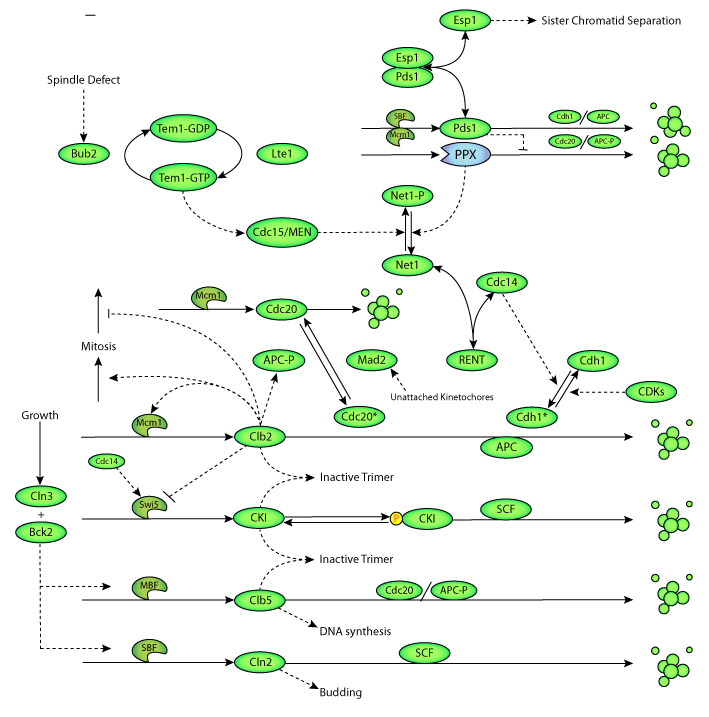 As might be expected for such an important process, the distinct phases and events of the cell cycle are carefully regulated by specific proteins. The cell cycle regulatory system is most fully understood for budding yeast, Saccharomyces cerevisiae. A hypothetical molecular mechanism, potentially underlying cell cycle control in this organism, is outlined in the figure below. However, these networks of interacting proteins are so complex that the functional integration of the network cannot be understood by intuition alone. Mathematical models, which describe molecular interactions and reactions with biochemical rate equations, provide an integrative framework with which the complexities of molecular regulatory networks can be studied. In the Chen et al. 2004 publication described here, the authors develop a mathematical model to analyse cell cycle control in budding yeast. Model simulations reveal that the data generated by the model are in accord with the physiological properties of many genetic strains of budding yeast. The mathematical model is also useful in that it can be used to interpret existing experimental data and help to design new experiments. A schematic diagram of the cell cycle control mechanism in budding yeast. Derived from workspace Chen, Calzone, Csikasznagy, Cross, Novak, Tyson, 2004 at changeset edb741dbe5d9.